Snack Recipes How to Make dorayaki Japan .Dorayaki is the name of a cake that originated in Japan. Baked cakes are round and similar to pancake is made ​​from a mixture of flour with baking soda, eggs, honey and sweeteners. If the pancake presentation can be added with various toppings then on dorayaki presentation is by stacking two cakes dorayaki where the middle is inserted first content material in the form of butter, peanut paste and meises. Dorayaki itself known and spread through the spectacle of animated films where Doraemon Doraemon is also at the same time the main character in the cartoon movie really liked the cake dorayaki. In each episode of this dorayaki cake often appear in multiple storylines making it remembered by anyone watching. And if you lie once Doraemon animated movie buff but do not know this dorayaki cake. The cakes usually presented as a snack you can try kreasikan at home by following some stage of manufacture as in the recipe how to make snacks dorayaki following Japanese. Combine 130 g flour with ½ teaspoon baking soda. Stir well and sisihkam. Mix 2 eggs with 80 g sugar, 1 tablespoon honey, 50 cc of water and salt to taste. Stir and mix with the above mixture and add enough water dambil keep stirring until it becomes dough dorayaki average. Use the whisk for easy stirring. Let the dough in the container until the resulting granules bubbles on the surface of the dough and stir briefly. Prepare teflon and heat and let the oil spread sufficiently. Contents teflon that has been heated by the batter dorayaki to widen tarnishes Teflon Teflon then cover and leave to approximately 2 minutes in length until the exit granules dorayaki bubbles on the surface and edges dry out and turn the position. This step is just like baking a pancake just the pancake position is not reversed after the bottom dries. 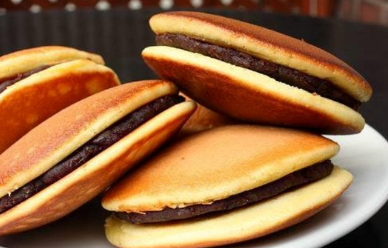 If the top and bottom dorayaki ripe and turns dark, lift. Repeat this step until the dough dorayakinya nothing left. Next put one dorayaki on a plate, spread it with butter, red bean paste and chocolate sprinkles meises then cover with another dorayaki. And so on. Dorayaki once enjoyed the cake is still warm will feel more solid. 0 Komentar Untuk "Snack Recipes How to Make dorayaki Japan"